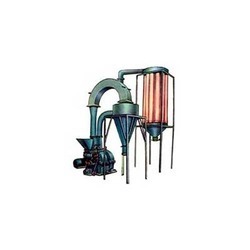 Being a customer based organization, we work hard to offer a wide gamut of Hammer Type Pulverizer to the patrons. These are designed and manufactured by a team of hardworking personnel, employing technologically updated machines and equipment. Customers can purchase these conveyors from us in different sizes and dimension, as per their requirements. This are fabricated with forged steel coat with very hard alloy cyclone air separator complete with connecting pipes and angle iron frame for cyclone a automatic feeder is provided for regular feed and static type dust collector with angle iron frame but without electric motor. These products are widely applauded by the patrons for their attributes like simple installation, rust bearing, low maintenance cost and longer working life. Looking for Hammer Type Pulverizer ?